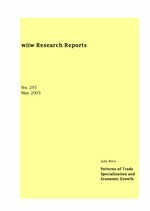 This report investigates the impact of trade structure and trade specialization on long-run development patterns in a heterogeneous set of countries, including most OECD countries, developing and rapidly industrializing Asian and Latin American countries as well as ten Central and Eastern European countries over the period 1981 to 1998. The hypothesis that not trade per se matters for economic development, but that technology and skill intensity of trade flows is important, is empirically tested using data on various macroeconomic variables (GDP, investment, FDI inflows, schooling) together with industrial data on exports and imports from two sources: the UNIDO Industrial Demand-Supply Balance Database and the UN trade database. Industries are grouped according to their skill intensity, using a taxonomy of manufacturing industries by Peneder (1999). The analysis of a revealed comparative advantages over time, using an index developed by Vollrath (1991), shows a trend towards de-specialization (i.e. specialization has become less pronounced) together with convergence for most countries, with the exception of South Asia. This has previously been observed for the OECD. This development is more pronounced in extremely low- and high-skill intensive industries, which are also the industries where initial specialization has been strongest. Based on these descriptive results, the impact of certain specialization patterns on aggregate economic growth is tested in a panel, using a fixed effects model. The results point towards a role for trade structure in economic growth, although not as strong as expected. Especially trade in medium high-tech and in high-tech industries relates positively with GDP growth for East Asia, but also for the advanced OECD countries. Medium low-skill intensive exports (presumably to a large extent the transport industry) play a special role in catching-up economies, including East Asia. Finally, differences between the impact of export and import structure are observed. Thus, we conclude that the channels by which trade influences growth differ between exports and imports.